The ‘’Nationale Thuiswinkels Awards’’ is an initiative from Thuiswinkel.org which is an organisation for companies that sell products and/or services online to consumers. The initiative has the goal to organise and finance independent award elections for the branch. On Thursday 26 March of 2015 the 14th Nationale Thuiswinkel Awards were awarded. 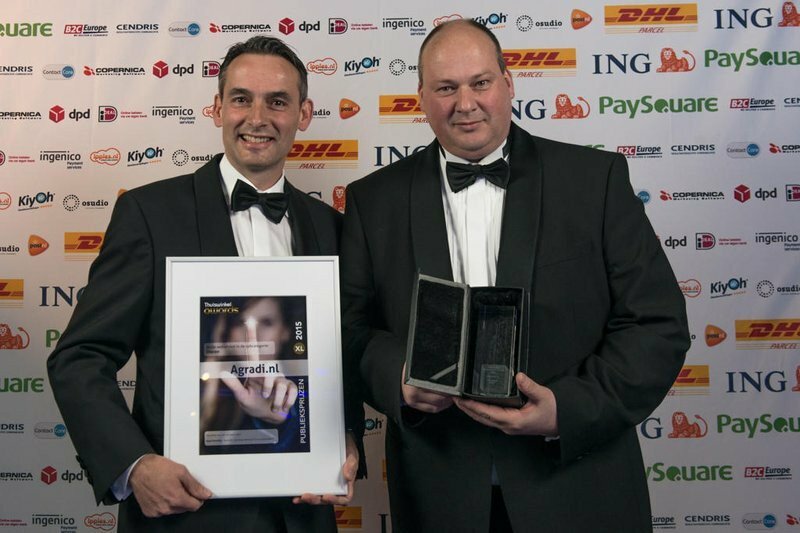 Agradi won the Dutch award for best webshop in the category Animals for the third time. Agradi was the best in its segment in 2011, 2012 and 2015. The directors of Agradi Oskar van Straaten and Rello Wanders are very happy with the price. “This proves that hard work pays off and we are very happy that our customers are so satisfied with our products and service. This gives us new motivation to keep working hard on improving the quality of our services and products. One of the main focus points for Agradi at the moment is going international." Agradi: Passion for animals and outdoor since 1998. Agradi is one of the biggest online animal- and outdoor shops there is. A young company full of energy that puts great value on service and quality. Agradi offers a way to buy everything for animal and outdoor in a modern way using the webshop. Clear, orderly, easy and cheap; those are the main points for Agradi. With over 100.000 products in its assortment Agradi offers something for everyone; whether you are professional or just have a hobby.